1.1 To develop students’ linguistic and functional competence in the English language so that they can use the language as a tool for communication, for study, for work, for enjoyment and for personal enrichment. 1.2 To empower students with the capabilities for lifelong and independent learning, adaptation to change, and critical and exploratory thinking innovation. Two times a year, the English Ambassadors organize a themed week with a range of related activities echoing the specific theme. Over the years, we have had English December, Roald Dahl’s Week, Disney Heroes Week and Travels Week in addition to the weeks celebrating Magic and Adventures. 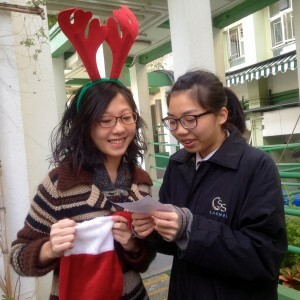 During the Week, there is usually an English Carnival in which various game stalls are staged for students to have a fun English time and redeem little gifts during English Friday lunch hour. 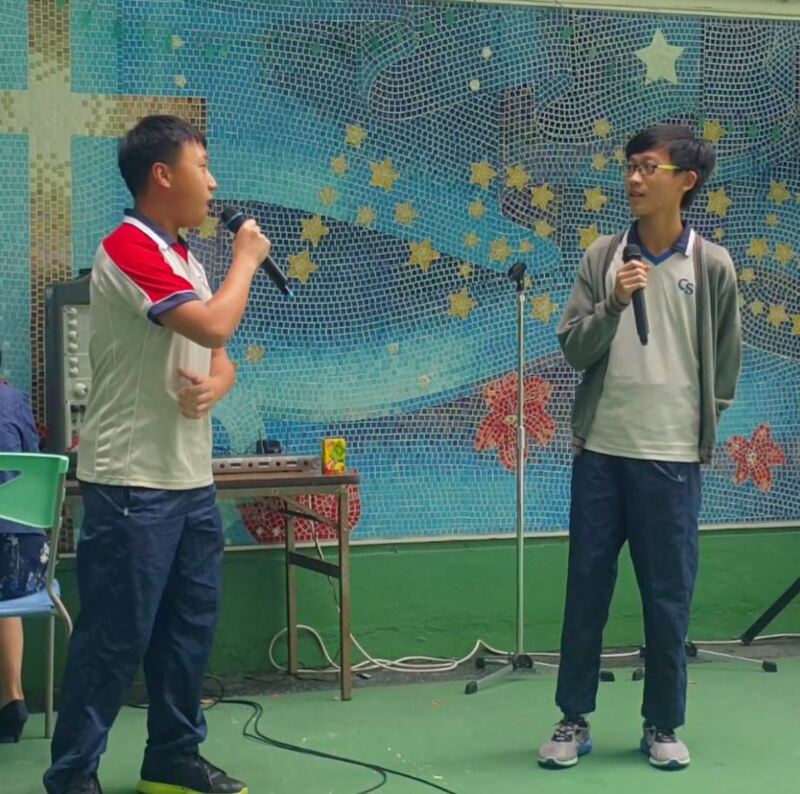 On more literary themes, we also stage the Oral Showcase in which students from different forms deliver multiple spoken pieces of the theme, ranging from poem recitals, dramatic duologue, interpretive reading to speech deliveries. 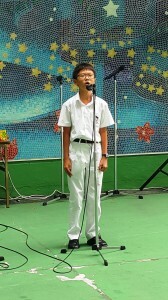 The performers often wow the audience with their articulation in words and thoughts, as well as their love in literary pieces. 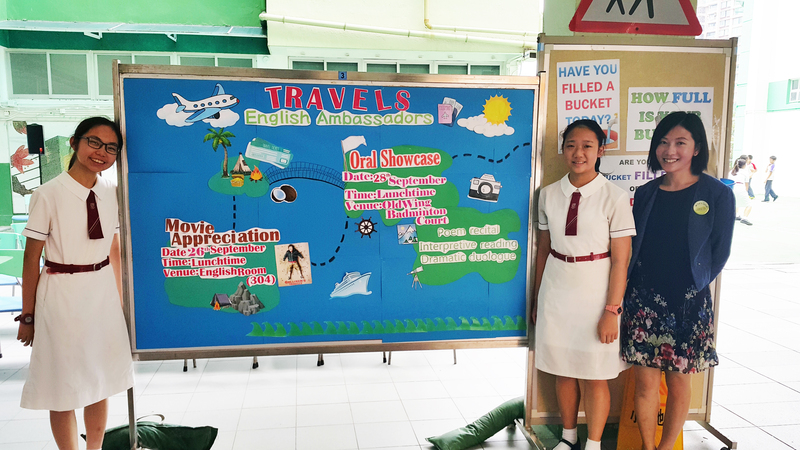 The multiple Oral Showcases we have held have indeed added spice to our English Fridays and infused English literary appreciation to our campus. For movie goers and book lovers, the Movie Appreciation and Book Exhibition in the themed weeks are a must-visit. Students enjoy the free popcorn provided in the former during lunch hour in the English Room, and cannot help flipping the featured titles in the latter. 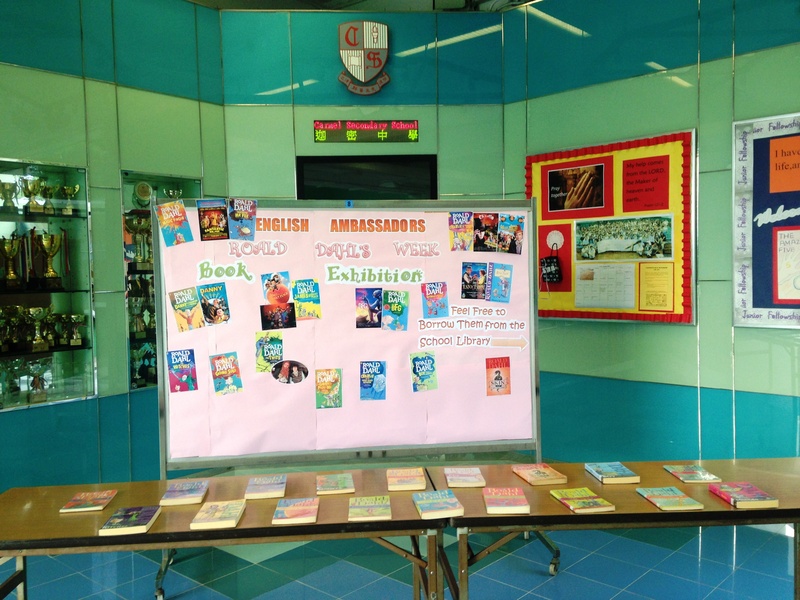 The two events indeed motivate students to explore more titles in the school library as well. 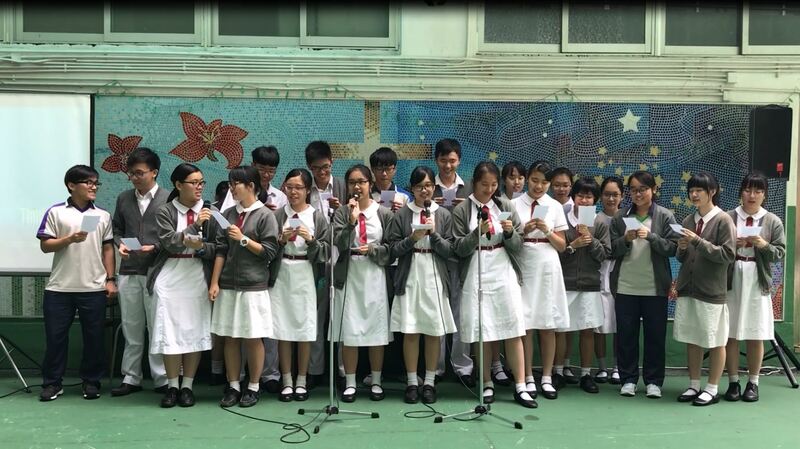 The English Activity Day was organized by the S3 English subject leaders on 3 December 2015. The six junior form students prepared fun game stalls to help their fellow students learn interesting idioms. They brainstormed ideas, took care of the details and ran the game stalls themselves. The students demonstrated excellent collaboration and creativity in this student-led activity. The Story-sharing Corner is a well-established function organized by the English Department. It is organized about 15 times over the year for primarily S1 and S2 students, who share their books with seniors from S3 and above. Students’ enthusiasm for sharing is always tremendous. The senior form student helpers also enjoy acting as “student-teachers” listening to their schoolmates’ story sharing. The activity enhances both students’ oral and listening skills and promotes peer support. Thanks to the very generous donation from our alumnus, Mr. Joshua Cheung, our English Room got newly furnished and relocated. A lot of thought has been put into the hardware and overall design of the room to maximize its functionality and versatility. The colourful tables encourage group work and discussion in classroom learning in both oral and enrichment classes in junior forms. 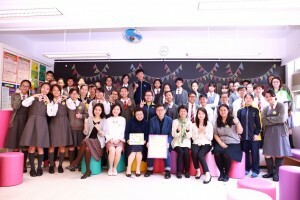 With them folded, a mere classroom is easily turned into an activity room for a range of English events, such as debating, drama, movie appreciation, English Carnival, public speaking, storytelling, book exhibition and so on, especially when armed with a platform. Meanwhile, the sofa, I.T. bar as well as the board games shipped from overseas all add a touch of chill and infuse fun into the Room, which is particularly welcoming for our Weekly Opening. The Room also successfully creates a language-rich environment with English posters, magazines and students’ works posted all around. 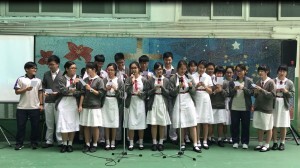 We expressed our heartfelt gratitude for such kind donation and dedication from the donor and all teachers and students involved in the Opening Ceremony in November. At the Grand Opening with the project donor, Mr. Joshua Cheung, our Principal, Vice-principal, English Ambassadors and English debaters and English subject leaders. The Chairlady of the English Ambassadors (2016), 5D Enoch Wong, gave a thank-you speech in the Grand Opening of the English Room. 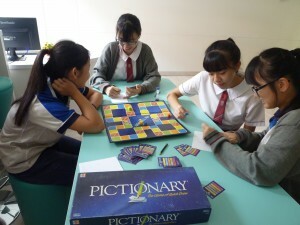 Students enjoying English board games at the Weekly Opening. The Inter-house English Debating Contest is an annual event for eloquent speakers across all forms to meet and challenge each other on a range of local issues. Non-debating-team members often treasure this chance to sharpen and showcase their debating skills. 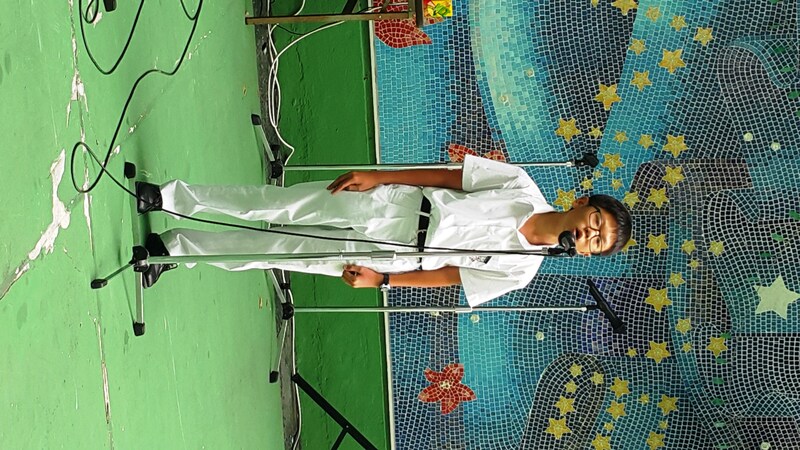 The preliminary round winners fought for the championship in the open area to make an eloquent English Friday. In 2017-2018, the English Debating Team has had another rewarding year taking part in a wide range of English debating contests and tournaments of various formats, from the locally familiar Australia-Asia style, the World Schools style to the British Parliamentary one. In the past year, some of the debaters even went the extra mile in oration and successfully delivered impressive performances.